Toxoplasmosis is a disease caused by an obligate intracellular protozoal parasite, Toxoplasma gondii, whose name was derived from the crescent shape of the parasite (toxon is Greek for "arc"), as well as the name of the North African rodent in which it was first observed, Ctenodactylus gundi. T gondii is one of the most successful protozoal parasites; it infects the nucleated cells of virtually all warm-blooded animals. Some species of felines are the definitive host for sexual reproduction of the parasite; however, asexual reproduction occurs in secondary hosts, such as rodents, livestock, birds, and humans, culminating in the formation of tissue cysts, which persist for the lifespan of the secondary host. It is important to differentiate patients with clinical infection from those who are simply seropositive for T gondii via exposure to toxoplasmosis. In adults, most T gondii infections are subclinical, but severe infection can occur in patients who are immunocompromised, such as those who have acquired immunodeficiency syndrome (AIDS) and malignancies. Affected organs include the gray and white matter of the brain (as shown in the images below), retinas,  alveolar lining of the lungs (where the infection may mimic Pneumocystis carinii infection), heart, and skeletal muscle. AIDS-associated Toxoplasma encephalitis results from reactivation of chronic latent infection in more than 95% of patients. 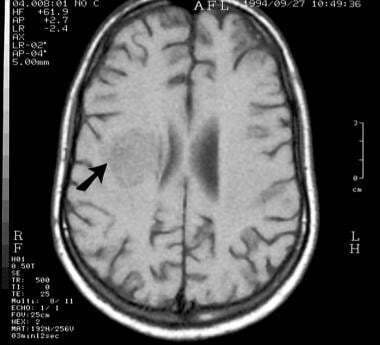 T1-weighted axial brain magnetic resonance image at the level of the basal ganglia in a 24-year-old man with human immunodeficiency virus infection. The image shows hypointense lesions in the region of the thalami (arrows) caused by toxoplasmosis. 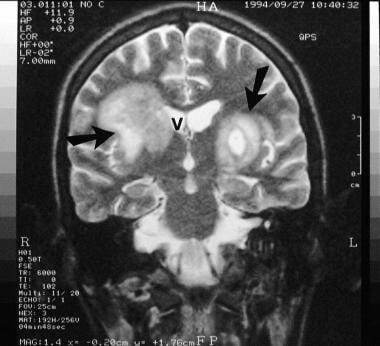 T1-weighted axial brain magnetic resonance image at the level of the upper lateral ventricles in a 24-year-old man with human immunodeficiency virus infection (same patient as in the previous image). The image shows a hypointense mass compressing the right lateral ventricle (arrow) . Transaxial contrast-enhanced computed tomography scan in a 24-year-old man with human immunodeficiency virus infection and central nervous system toxoplasmosis (same patient as in the previous 2 images). This image was obtained after the patient received 20 days of treatment, with resultant clinical improvement, and shows a low-attenuating mass with minor peripheral ring enhancement. Note the reduction in the mass effect. T2-weighted coronal magnetic resonance image at the level of the insulae in a patient with human immunodeficiency virus infection and central nervous system toxoplasmosis (same patient as in the previous 3 images). The image shows large, bilateral hyperintense lesions (almost symmetrically placed on either side of the third ventricle and/or lateral ventricle) (arrows). Note the slight mass effect on the right lateral ventricle (V). Human infection usually occurs via the oral or transplacental route. Consumption of raw or undercooked meat that contains viable tissue cysts (principally lamb and pork), direct ingestion of oocysts from contaminated soil and water, and consumption of unwashed vegetables are common sources of infection. Infection has also been reported in individuals who drink unpasteurized goat's milk. Transplacental infection may occur if the mother acquires the parasite acutely or if a latent infection is reactivated during immunosuppression. Prevalence of congenital infection ranges from 0.1 to 0.3 per 1000 live births. The maternal-fetal transmission rate increases with gestational age at maternal seroconversion, from less than 15% at 13 weeks of gestation to over 70% at 36 weeks. Fetal infection usually occurs in the third trimester, but more severe sequelae may ensue if the fetus is contaminated in the first trimester. Congenital toxoplasmosis may be associated with anomalies such as microcephaly, microphthalmia, hydranencephaly, hydrocephalus secondary to aqueduct stenosis, porencephalic cyst, and periventricular calcification. Plain radiographs play a limited role in the diagnosis of toxoplasmosis. An exception is congenital toxoplasmosis, in which calcification within the skull can occasionally be depicted. The skull vault may be thickened with opposed or overlapping sutures. In patients with AIDS, occasional pulmonary involvement may be shown as a lung infiltrate that is associated with hilar/mediastinal lymphadenopathy. Cardiac involvement, which is rare, may be demonstrated on chest radiographs as cardiomegaly in association with features of pulmonary venous hypertension. CT scans of the brain may show single (30%) or multiple nodular lesions. More commonly, following the IV administration of contrast medium, CT scan studies demonstrate thin-walled cavitating lesions with ring enhancement. Edema of the surrounding white matter is often depicted as well. Hemorrhage and calcification may occur following medical treatment, although ring calcification has been described on CT scans at the time of first diagnosis. However, ring calcification is rare in acquired disease compared with congenital disease. Concomitant cerebral atrophy is seen in approximately one third of patients; this is presumably the result of the direct cellular damage caused by the human immunodeficiency virus (HIV). Fellner et al described a case of unilocular toxoplasmosis that simulated intracerebral tumor in a patient without evidence of AIDS. The patient had a single, tumorlike lesion in the right parietal lobe, as shown on CT scan and MRI. During neurosurgical intervention, no tumor was found; however, the final diagnosis was based on histopathology. In the congenital form of toxoplasmosis, CT scans may reveal diffuse hydrocephalus that is associated with multiple, irregular, nodular, cystlike, or curvilinear calcifications in the periventricular areas and the choroid plexus. The lesions are bilateral and vary from a few millimeters to 2 cm, and there may be associated hydrocephalus. The skull vault may be thickened with opposed or overlapping sutures. 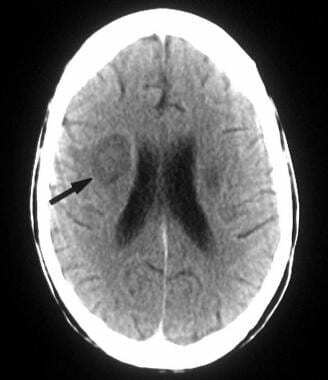 The characteristic sign of CNS toxoplasmosis is the asymmetrical target sign, which is detectable on CT and MRI scans, although MRI is more sensitive. This asymmetrical target sign represents a ring-enhancing abscess, which contains other similar ring-enhancing abscesses as well as similarly enhancing, eccentric nodules in the abscess cavity. A study of 31 patients with congenital toxoplasmosis showed a clear relationship among the CNS lesions observed on computed tomography (CT) scans, neurologic deficit, and the date of maternal infection. CT scan findings in these infants are characteristic, depending on the timing of maternal infection—namely, was the mother infected and did she undergo seroconversion before the 20th week of gestation, was she infected during weeks 20-30 of gestation, or was she infected and did she undergo seroconversion after the 30th week of gestation? Toxoplasmosis is the most common cerebral mass lesion encountered in HIV-infected patients, and its incidence has increased markedly since the beginning of the AIDS epidemic. There are occasionally unusual appearances of CNS toxoplasmosis that make diagnosis by standard imaging techniques difficult or impossible. The advent of MR spectroscopy has increased the ability to differentiate between various CNS lesions. 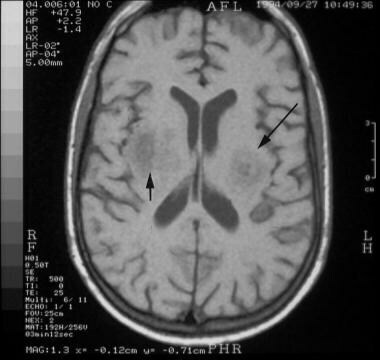 On T1-weighted precontrast MRIs, the lesions are hypointense relative to brain tissue (as demonstrated in the image below). On T2-weighted MRIs, the foci of infection are usually hyperintense, but they can occasionally be isointense to hypointense. [7, 8, 9, 10] False-positive findings may result from lymphoma, other CNS infections (particularly fungal infections), and CNS metastases. Nonenhanced T1-weighted images in a patient infected with human immunodeficiency virus and cerebral toxoplasmosis. These images show hypointense, asymmetrical, bilateral periventricular/basal ganglial lesions. Active lesions are often surrounded by edema. Focal nodular or ring enhancement (as shown in the images below) occurs in approximately 70% of patients after gadolinium enhancement. The lesions are rarely hemorrhagic; thus, MRI findings depend on the hemorrhagic stage of evolution. T1-weighted gadolinium-enhanced magnetic resonance image at the level of the fourth ventricle in a 32-year-old patient with human immunodeficiency virus infection. The image shows a peripheral, right frontoparietal ring-enhancing lesion (arrow). The patient presented with a solitary space-occupying lesion, which was confirmed to be secondary to toxoplasmosis. T1-weighted axial gadolinium-enhanced magnetic resonance image at the level of the basal ganglia in a 37-year-old patient with human immunodeficiency virus infection. The image shows 2 complex, ring-enhancing lesions in the basal ganglia on the right, surrounded by notable white matter edema. Additional lesions were noted elsewhere in the brain. This appearance is typical of central nervous system toxoplasmosis, which has the propensity to involve the basal ganglia. T1-weighted axial gadolinium-enhanced magnetic resonance images at 2 levels through the basal ganglia (same patient as in the previous image). These images show 2 complex, ring-enhancing lesions in the basal ganglia on the right, with surrounding notable white matter edema. This appearance is typical of central nervous system toxoplasmosis, which has the propensity for involvement of the basal ganglia. As noted earlier, Fellner et al reported the case of a patient without evidence of AIDS who presented with unilocular toxoplasmosis that simulated an intracerebral tumor. Although the patient’s CT scans and MRI showed a single, tumorlike lesion in the right parietal lobe, no tumor was found at surgery. On histologic examination, the asymmetrical target sign, which is detectable on CT and MRI scans, was observed, confirming the diagnosis. Gadolinium-based contrast agents have been linked to the development of nephrogenic systemic fibrosis (NSF) or nephrogenic fibrosing dermopathy (NFD). The disease has occurred in patients with moderate to end-stage renal disease after being given a gadolinium-based contrast agent to enhance MRI or MRA scans. NSF/NFD is a debilitating and sometimes fatal disease. Characteristics include red or dark patches on the skin; burning, itching, swelling, hardening, and tightening of the skin; yellow spots on the whites of the eyes; joint stiffness with trouble moving or straightening the arms, hands, legs, or feet; pain deep in the hip bones or ribs; and muscle weakness. For more information, see Medscape. A study by Guerini et al described the importance of periventricular ependymal enhancement in adults,  a finding that can signify an underlying pathology that requires prompt medical attention. The authors reported the pattern of periventricular contrast enhancement, basing the features they noted on the underlying infectious or tumor etiology. In addition, the differential diagnosis for each patient was derived from the patient's immune status and response to a trial of therapy, as well as the type of enhancement that was seen on MRI. The differential diagnosis included tumors (eg, lymphoma, ependymoma, germ cell tumor, or metastases), viral ependymitis (eg, cytomegalovirus, varicella-zoster virus), toxoplasmosis, and bacterial or tuberculous ventriculitis. Brightbill et al concluded that the appearance of Toxoplasma encephalitis in lesions viewed on T2-weighted MRI scans is so varied that a definitive diagnosis cannot be reached based on signal-intensity characteristics alone. In fact, it appeared that T2-weighted hyperintensity was pathologically correlated with necrotizing encephalitis, whereas T2-weighted isointensity correlated with organizing abscesses. They further surmised that in patients receiving medical therapy, it was possible that the T2-weighted MRI appearance of hyperintensity to isointensity could be a transitional change as a function of a positive response to antibiotic treatment. Thus, the signal-intensity change might be a means to determine the effectiveness of medical therapy. By extrapolation, fluid-attenuated inversion recovery (FLAIR) signal alterations that are easer to evaluate can be used in a similar fashion. A FLAIR image is presented below. 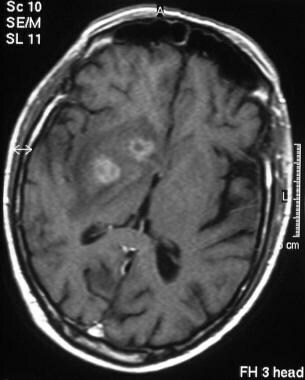 Axial fluid-attenuated, inversion recovery brain magnetic resonance image in a patient infected with human immunodeficiency virus and cerebral toxoplasmosis. These images show intense signal at the sites of the infection. D'Ercole et al concluded that MRI of the fetal brain can be used to confirm or exclude fetal cerebral defects in cases in which the ultrasonographic results are inconclusive or incomplete. D’Ercole et al reviewed 31 cases in which MRI verified ultrasonographic evidence of fetal brain defects. Histologic study of the fetus or postnatal radiologic examination confirmed the ultrasonographic evidence in 21 cases; MRI ruled out the ultrasonographic diagnosis in 10 cases (the infants were born healthy); and the MRIs were normal in 1 case of cerebral toxoplasmosis, in which ultrasonography showed periventricular calcifications. Overall, MRI confirmed or further documented the ultrasonographic findings for 20 cases; however, 4 of the 20 cases required fetal autopsy to determine the exact nature of the lesion. The asymmetrical target sign is highly suggestive of CNS toxoplasmosis, but it is detected in only 30% of patients. Other MRI patterns that are presumably related to the patient's altered immune status are not as specific and may be mimicked by various CNS infections and lymphoma. CNS lymphoma lesions are often solitary, whereas the nodules of CNS toxoplasmosis more often are multiple. A diagnosis of toxoplasmosis is favored over a diagnosis of lymphoma when more than 3 lesions or slender, ring-enhancing foci are seen or when marked edema is present. In addition, toxoplasmosis is more common subcortically than lymphoma and seldom affects the corpus callosum. Meningeal or ependymal involvement should provoke a search for other entities, such as lymphoma or other infections. Although toxoplasmosis meningitis has been described, it is extremely rare. The degree of perilesional edema is correlated directly with the patient's ability to mount an inflammatory response. The greater the edema, the greater the inflammatory response, and the better the prognosis. Edema also correlates with CD4 counts. Miguel et al reviewed the imaging studies of 14 patients with CNS toxoplasmosis in the context of differential diagnostic problems with CT scanning and MRI. Although the findings of these modalities demonstrated low specificity for the CNS mass lesions of patients with AIDS, the authors noted certain features that were more typical for CNS toxoplasmosis than for other diseases: nearly 95% of the lesions were round and had ring or nodular enhancement; 81.3% involved multiple lesions; 60.2% of lesions were localized to the cerebral cortical or corticomedullary junction, in which 100% of cases had at least 1 lesion; and approximately 35% of the lesions were <1 cm in diameter. On nonenhanced CT scans, 91.3% of the lesions were hypoattenuating; on T2-weighted MRIs, 53.4% of the lesions had at least 1 hypointense zone. Twenty-nine percent of the observed lesions on the T2-weighted MRIs included the presence of target-shaped lesions with hypointense centers, suggesting the diagnosis of CNS toxoplasmosis. The authors believed this finding had not been previously reported. 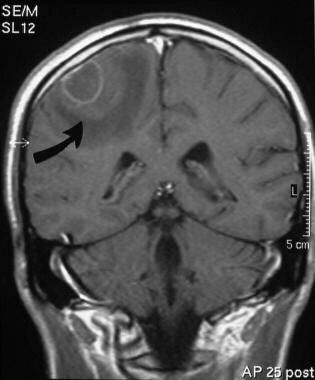 Miguel et al also noted that the presence of isoattenuating or hyperattenuating lesions on nonenhanced CT scans or irregularly shaped lesions was uncommon in CNS toxoplasmosis and that the appearance of a solitary lesion per se on CT scanning or MRI was not a good criterion for the differential diagnosis of CNS toxoplasmosis. In a hospital-based study of 188 consecutive patients who were seropositive for HIV type 1 (HIV-1) and who presented with possible signs or symptoms of first-ever CNS disease,  the confirmed diagnoses included cerebral toxoplasmosis (47 patients, 25.0%), HIV-1 encephalopathy (19 patients, 10.1%), progressive multifocal leukoencephalopathy (PML) (9 patients, 4.8%), and cerebral lymphoma (1 patient, 0.5%). Nine patients (4.8%) had other conditions. In 73 (38.8%), the initial CT scans or MRIs showed focal brain lesions, which were assessed prospectively. The positive predictive value for toxoplasmosis was 100% with the combined occurrence of multiple lesions and mass effect or contrast enhancement (23 patients) or in cases in which at least 1 space-occupying or enhancing lesion was located in the basal ganglia or the thalamus (26 patients). Solitary lesions with mass effect or contrast enhancement were also seen (26 patients), and cerebral toxoplasmosis was the cause in 22 patients (84.6%). Furthermore, 1 or more nonenhancing, nonmass lesions were present in 8 of the 9 patients with PML; however, this pattern had a predictive value of 47.1% for PML. The authors concluded that in the epidemiologic context of the study, specific imaging findings in HIV-1-seropositive patients are highly predictive for cerebral toxoplasmosis. However, findings may differ in other parts of the world where cerebral toxoplasmosis may be less prevalent among HIV-1-infected individuals. Recurrences of brain toxoplasmosis have been reported to correlate with persistent contrast enhancement both on CT scanning and on MRI. The demonstration of such areas of persistent contrast enhancement in patients who have received treatment for initial toxoplasmosis may be a valuable sign that they are at risk for recurrence. The pathologic findings of T2- and T1-weighted MRI sequences in cases of HIV infection were assessed in a study of 11 formalin-fixed brains at 0.5 T.  The extent of white matter abnormality that was seen on MRI broadly corresponded with the pathologic findings in 2 cases of PML and 1 case each of toxoplasmosis and lymphoma. Overall, however, histologic changes were more frequent than lesions on MRI, including cases in which conventional MRI did not reveal multiple tuberculous granulomas, multinucleate giant cells, microglial nodules, perivascular cuffing, and cytomegaloviral inclusions. On the other hand, 1 common finding on T2-weighted MRIs in 6 cases was punctate or patchy hyperintensity in the basal ganglia. The corresponding histologic changes included calcification of vessels with widened perivascular spaces and mineralized neurons. Revel and associates reported the imaging findings of 5 patients with AIDS who had received a previous diagnosis of, and subsequent treatment for, toxoplasmosis. Nonenhanced CT scans obtained approximately 6 months after the CNS infection showed hyperattenuating lesions. MRI was performed in all cases: in 4 of the 5 patients, the hyperattenuating areas on the CT scans were characterized by high signal intensity on the T1-weighted MRIs. In 2 of the 4 cases, pathologic correlation confirmed hemorrhage. In the fifth case, pathologic correlation verified the MRI findings that had suggested calcification. In another study of 12 cases of AIDS, the radiologic (MRI and CT scan) and pathologic findings in the brain were correlated. Balakrishnan et al noted 3 cases each of HIV encephalopathy, primary lymphoma, and toxoplasmosis and 1 case each of cryptococcosis, cytomegalovirus infection, and PML. MRI was better than CT scanning at clearly depicting the various cranial lesions; on the basis of MRI characteristics, HIV encephalopathy was distinguishable from other lesions, particularly PML. Although the basal ganglia were found to be the most common sites of involvement in opportunistic infections and primary lymphoma, reliable distinguishing features among lesions in the basal ganglia were not found, with the exception of a unique appearance for cryptococcal lesions. 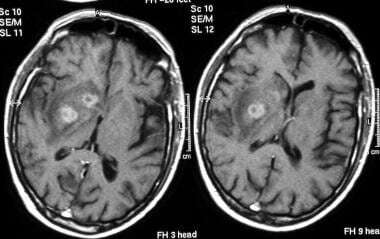 A variety of brain lesions occur in the setting of AIDS, including toxoplasmosis, tuberculoma, and primary lymphoma. Differentiation between these lesions can be difficult but is important because of the diverse therapeutic challenges. Antenatal ultrasonography is used to detect congenital toxoplasmosis. Ultrasonographic findings reveal toxoplasmosis in 36% of fetuses with the disease, including evolving symmetrical ventriculomegaly, intracranial periventricular and hepatic/splenic densities, focal destruction of cerebral tissue that is associated with enlargement of the neighboring cistern or ventricle, ocular calcification, microphthalmia, metaphyseal bands, irregularity of the metaphyseal border of the growth plate, fetal ascites, and increased placental thickness. In fetal blood, Toxoplasma -specific immunoglobulin M levels are elevated. Postnatal ultrasonography can be used to monitor ventricular size in infants up to 18 months of age or following closure of the fontanelles. In adult patients, abdominal ultrasonography may show hepatosplenomegaly and abdominal lymphadenopathy. Abdominal ultrasonography in adult patients with a history of abdominal pain and abnormal results on liver function tests may show hepatosplenomegaly and abdominal lymphadenopathy. Preliminary research suggests that positron emission tomography (PET) scanning with fluorine-18-fluorodeoxyglucose (FDG) can reliably distinguish CNS infections from CNS malignancies, such as lymphoma, in patients with HIV infection. 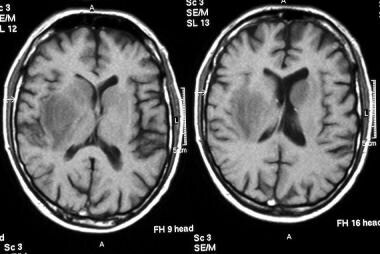 Thallous chloride (201Tl) and technetium-99m (99mTc) sestamibi (MIBI) brain imaging has also been used to distinguish CNS infections from CNS lymphoma. MIBI imaging appears to be more helpful than 201Tl imaging because of its higher specificity and equal sensitivity. Larger prospective studies are required to confirm the impression that FDG-PET can reliably differentiate CNS infection from CNS lymphoma. MIBI imaging appears to have a higher specificity than 201Tl imaging. False-negative scans may occur with both MIBI scanning and 201Tl scanning, as well as in patients following medical treatment for toxoplasmosis. Rb-Silva R, Nobrega C, Reiriz E, Almeida S, Sarmento-Castro R, Correia-Neves M, et al. Toxoplasmosis-associated IRIS involving the CNS: a case report with longitudinal analysis of T cell subsets. BMC Infect Dis. 2017 Jan 13. 17 (1):66. [Medline]. [Full Text]. Balasundaram MB, Andavar R, Palaniswamy M, et al. Outbreak of acquired ocular toxoplasmosis involving 248 patients. Arch Ophthalmol. 2010 Jan. 128(1):28-32. [Medline]. de Oliveira Azevedo CT, do Brasil PE, Guida L, Lopes Moreira ME. Performance of Polymerase Chain Reaction Analysis of the Amniotic Fluid of Pregnant Women for Diagnosis of Congenital Toxoplasmosis: A Systematic Review and Meta-Analysis. PLoS One. 2016. 11 (4):e0149938. [Medline]. [Full Text]. Ikebe T, Sasaki H, Takata H, Miyazaki Y, Ohtsuka E, Saburi Y, et al. Toxoplasmic Encephalitis with Untreated Hairy Cell Leukemia Variant. Intern Med. 2016. 55 (21):3175-3180. [Medline]. D'Ercole C, Girard N, Boubli L, et al. Prenatal diagnosis of fetal cerebral abnormalities by ultrasonography and magnetic resonance imaging. Eur J Obstet Gynecol Reprod Biol. 1993 Aug. 50(3):177-84. [Medline]. Philip-Ephraim EE, Charidimou A, Williams E, Kajogbola G. Stroke-Like Presentation of Cerebral Toxoplasmosis: Two HIV-Infected Cases. Cerebrovasc Dis Extra. 2015 Jan-Apr. 5 (1):28-30. [Medline]. da Cunha Correia C, Ramos Lacerda H, de Assis Costa VM, Mertens de Queiroz Brainer A. Cerebral toxoplasmosis: unusual MRI findings. Clin Imaging. 2012 Sep-Oct. 36 (5):462-5. [Medline]. Hakko E, Ozkan HA, Karaman K, Gulbas Z. Analysis of cerebral toxoplasmosis in a series of 170 allogeneic hematopoietic stem cell transplant patients. Transpl Infect Dis. 2013 Dec. 15 (6):575-80. [Medline]. Fellner F, Schmitt R, Helmberger T, Büsing CM, Obletter N. Unilocular toxoplasmosis simulating intracerebral tumor. Bildgebung. 1994 Mar. 61(1):44-6. [Medline]. Chang L, Miller BL, McBride D, et al. Brain lesions in patients with AIDS: H-1 MR spectroscopy. Radiology. 1995 Nov. 197(2):525-31. [Medline]. Simone IL, Federico F, Tortorella C, et al. Localised 1H-MR spectroscopy for metabolic characterisation of diffuse and focal brain lesions in patients infected with HIV. J Neurol Neurosurg Psychiatry. 1998 Apr. 64(4):516-23. [Medline]. Chinn RJ, Wilkinson ID, Hall-Craggs MA, et al. Toxoplasmosis and primary central nervous system lymphoma in HIV infection: diagnosis with MR spectroscopy. Radiology. 1995 Dec. 197(3):649-54. [Medline]. Camacho DL, Smith JK, Castillo M. Differentiation of toxoplasmosis and lymphoma in AIDS patients by using apparent diffusion coefficients. AJNR Am J Neuroradiol. 2003 Apr. 24(4):633-7. [Medline]. [Full Text]. Dibble EH, Boxerman JL, Baird GL, Donahue JE, Rogg JM. 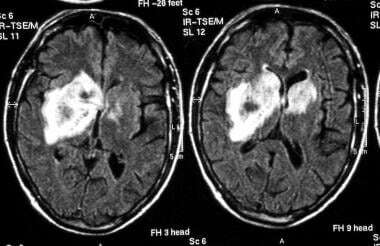 Toxoplasmosis versus lymphoma: Cerebral lesion characterization using DSC-MRI revisited. Clin Neurol Neurosurg. 2017 Jan. 152:84-89. [Medline]. Guerini H, Helie O, Leveque C, et al. [Diagnosis of periventricular ependymal enhancement in MRI in adults]. [French]. J Neuroradiol. 2003 Jan. 30(1):46-56. [Medline]. [Full Text]. Brightbill TC, Post MJ, Hensley GT, Ruiz A. MR of Toxoplasma encephalitis: signal characteristics on T2-weighted images and pathologic correlation. J Comput Assist Tomogr. 1996 May-Jun. 20(3):417-22. [Medline]. Miguel J, Champalimaud JL, Borges A, et al. [Cerebral toxoplasmosis in AIDS patients, CT and MRI images and differential diagnostic problems]. [Portugese]. Acta Med Port. 1996 Jan. 9(1):29-36. [Medline]. Steinmetz H, Arendt G, Hefter H, et al. Focal brain lesions in patients with AIDS: aetiologies and corresponding radiological patterns in a prospective study. J Neurol. 1995 Jan. 242(2):69-74. [Medline]. Laissy JP, Soyer P, Parlier C, et al. Persistent enhancement after treatment for cerebral toxoplasmosis in patients with AIDS: predictive value for subsequent recurrence. AJNR Am J Neuroradiol. 1994 Oct. 15(9):1773-8. [Medline]. Hawkins CP, McLaughlin JE, Kendall BE, McDonald WI. Pathological findings correlated with MRI in HIV infection. Neuroradiology. 1993. 35(4):264-8. [Medline]. Revel MP, Gray F, Brugieres P, et al. Hyperdense CT foci in treated AIDS toxoplasmosis encephalitis: MR and pathologic correlation. J Comput Assist Tomogr. 1992 May-Jun. 16(3):372-5. [Medline]. Balakrishnan J, Becker PS, Kumar AJ, et al. Acquired immunodeficiency syndrome: correlation of radiologic and pathologic findings in the brain. Radiographics. 1990 Mar. 10(2):201-15. [Medline]. Dhombres F, Friszer S, Maurice P, Gonzales M, Kieffer F, Garel C, et al. Prognosis of Fetal Parenchymal Cerebral Lesions without Ventriculomegaly in Congenital Toxoplasmosis Infection. Fetal Diagn Ther. 2017. 41 (1):8-14. [Medline]. [Full Text]. Immunohistochemical or immunofluorescent techniques can detect the Toxoplasma gondii parasite. We wish to thank Hari Panigrahi, MD, MBBS, for previous contributions to this article.